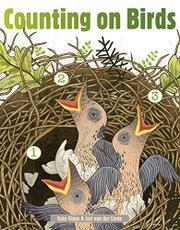 Little ones are encouraged to count from one to 10 as they watch a trio of birds grow from eggs in a nest to fledglings to birds in full flight. “One nest” with three eggs sits on the branch of an oak tree. “Two birds” are taking turns keeping the eggs warm. And so readers are introduced to numbers one and two as well as the beginning of life for these birds. The charming mixed-media illustrations, set against a clean white background and using plenty of fresh, spring green, follow the progress of the eggs as they hatch. The hatchlings open three wide mouths ready for food. “Four…five…six eyes” watch as the parents bring all sorts of insects to feed them. The next spread will keep readers on their toes, as six legs holding on to the branch are depicted, but it is “seven—then all eight—toes” that are taking hold. It will take “nine days” for the fledglings to develop, test, and clean their flight feathers. In the last spread, as the family soars over the trees, “ten wings flap and sail across the sky.” In each spread, the appropriate numeral or numerals, circled to attract attention, are placed close to the written number words.